The following questions are designed to obtain information from professional lobbyists in Georgia regarding desired training and professional development topics. The Georgia Professional Lobbyists Association (www.galobbyists.org) will develop curriculum for the upcoming meeting based on a compilation of responses. Please feel free to offer as much input on the open-ended questions as comes to mind. * 1. When is the most convenient time of year for you to participate in professional development training? * 2. Given the legislature will convene a special session in mid-August, would you be interested in participating in classes in Atlanta during the special session? * 3. If GPLA does not conduct professional development during the special session, to what locations (cities, resorts, facilities) would you be willing to travel for the classes/training? * 4. Classes will be lead by experienced professionals in the topic field and moderated by GPLA members. So that we may gauge the quality of instruction you desire, how much would you be willing to pay per training hour? * 5. 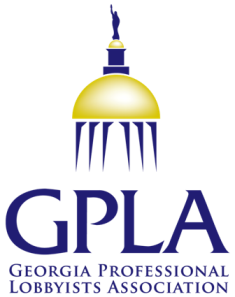 GPLA does not anticipate inviting elected officials to present at training sessions, but does not want to dismiss such a presentation if members desire information from elected officials that is relevent to improving lobbying skills or performance. What professional development topics or information could be taught/presented by an elected official? * 6. What professional development topics or information could be taught/presented by a top staffer at a state department or agency? * 8. Would you prefer one full day conference or a two-day conference with half seminars? * 10. Please list additional ideas in the area below. Thank you for your responses. For more information and survey results, please visit www.galobbyists.org.